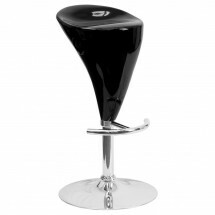 ✔ Height adjustable swivel seat with gas lift ✔ Chrome base ✔ Foot rest ✔ Weight capacity; 330 Lbs. The retro style Flash Furniture Contemporary Black Plastic Adjustable Height Bar Stool boasts a unique style that highlights any space. 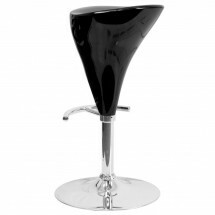 Designed with a comfortable seat that is joined with a corrosion-resistant chrome base, this bar stool provides exceptional strength and durability. Thanks to its adjustable swivel seat, you can easily raise or lower this chair for sitting at a breakfast bar or kitchen counter. 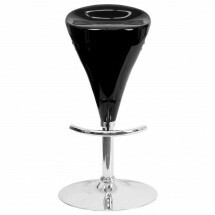 For added convenience, this bar stool is built with a foot rest to support your feet as you dine. Dimensions: Base diameter: 17-5/8"; 24-1/2" - 33"